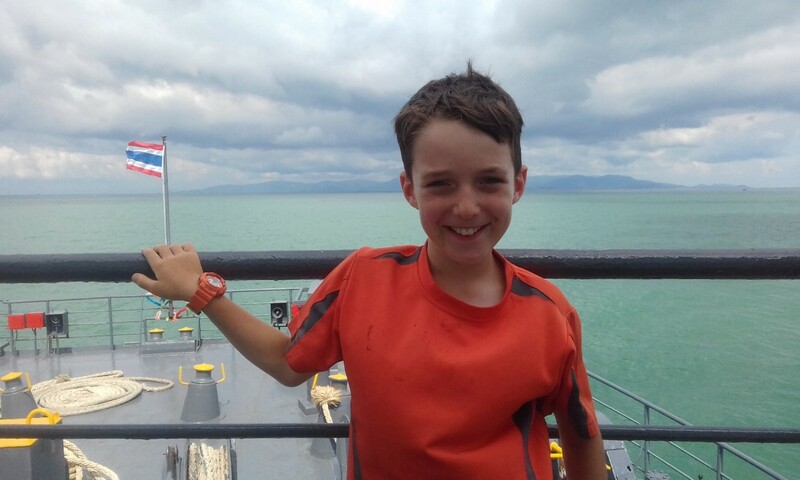 Everybody feeling a bit better today, which was lucky because we had a long day and needed to catch a ferry to Ko Sumui by 1:30pm. Having the goal was a good way to keep us focused and plan out our cycle. We broke it down in the 15km blocks and took short breaks at the end of each block. Not everything went to plan. Like always we tried to keep off the highways, but that sometimes means the road weren’t well maintained. One section was on potholed gravel and Julie’s front tire got stuck in thick gravel and she had a nasty fall. Robert is a master in this situation (it is not the first time and won’t be the last) and jumped off the back of the tandem like a rabbit and didn’t have a scratch to show for the fall. In another incident further down ride we rode the worst potholed sealed road of the trip so far. It is also the first time we have over taken a car – see below. Although the road was in bad condition on two wheels you could navigate around the potholes. The driver of the car was very cautious and couldn’t avoid the potholes, so was only doing about 15kph. Anyhow, we got to the ferry terminal in perfect timing and rode to the front of the line. The ticketing lady wasn’t sure how to handle a tandem, but after phoning a friend, just treated the bike like a motorbike with a passenger. The ferry trip was very smooth and gave great views from the bow. 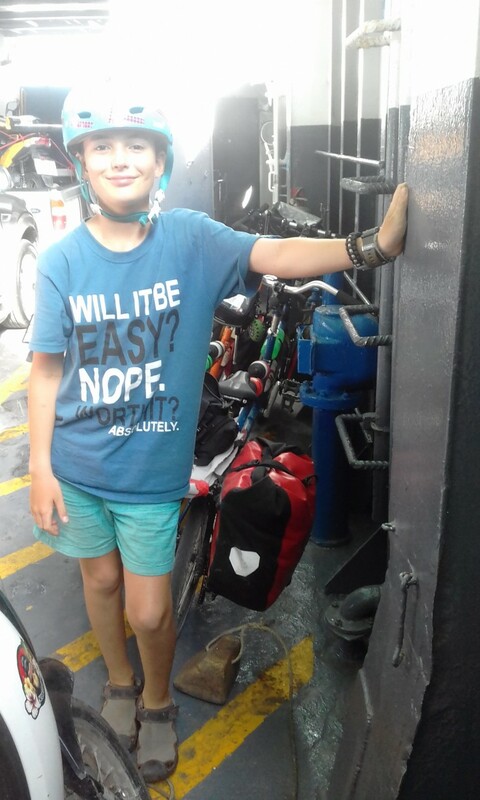 Here’s the less glamourous view of the cargo hold with our bikes. 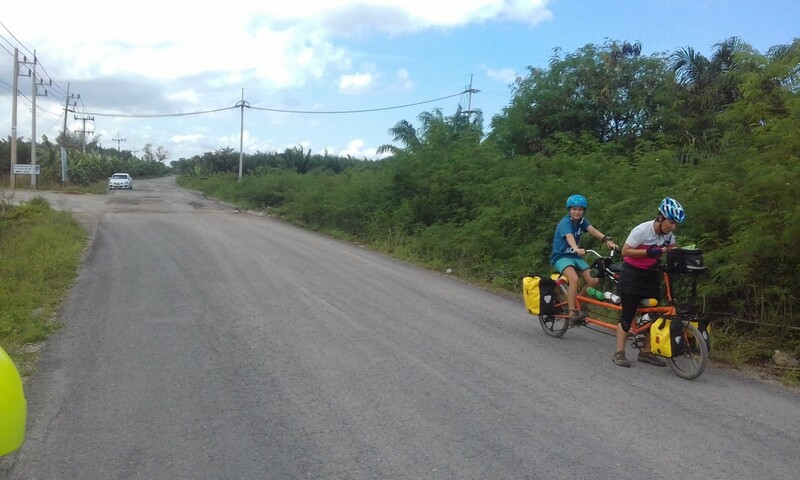 Previous PostDay 30 – Ao Luek to Surat ThaniNext PostSomewhere on the island of Samui. Each day becomes a saga. 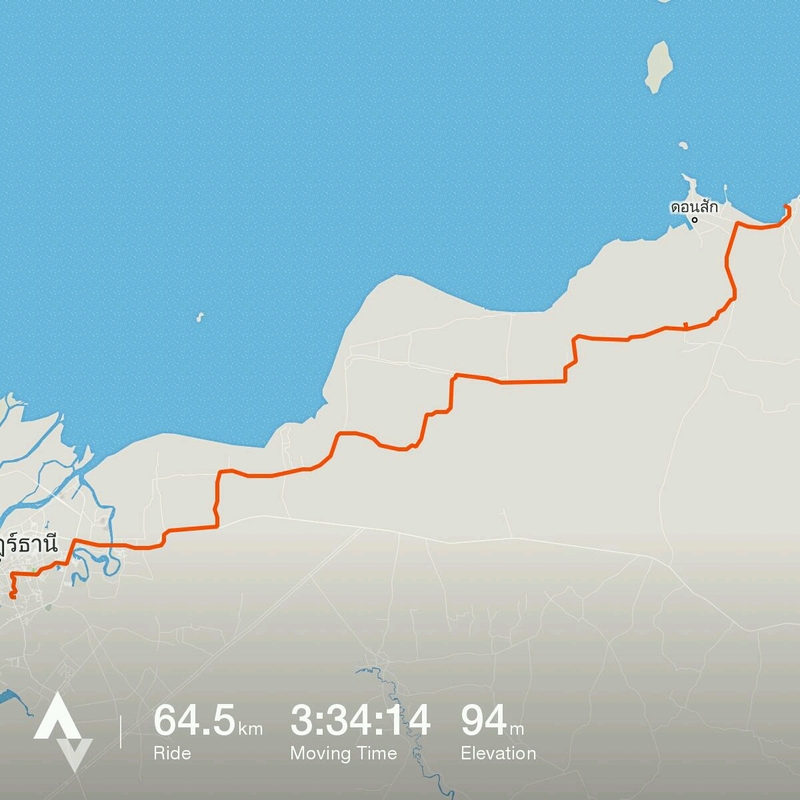 Boat trip was a good goal and way to do those kms. Are you feeling well now? Grey days here. Not 100% yet, but getting better each day. Robert is a day behind my symptoms, so had a big sleep this afternoon. Hey Matt, Thanks for commenting. Glad you are enjoying the blog. Did you end up playing in the mixed doubles tournament? I wish I could have a cuppa at Mrs Jones. I have been caffeine free for 5 weeks because the coffee here is awful. No didn’t play tennis – lazy kids. At Mrs jones right now. Robert’s had enough. You could sub with him or you could pop your bike on am airasia flight and join us. Allister is so jealous. He only got to listen to it on radio. We were staying in a little rural town where nobody spoke English. I tried using Google Translate to find somewhere with satellite tv with sport channels, but they didn’t know what I was talking about or thought I wanted to play sport. In the end I resorted to listening to the commentary. It was an epic battle. I was going for Rodger, but thought he had lost it at the beginning of the fifth set. It would have been amazing to see his turnaround.